There's a lot of promise here and, while many of our concerns are fixable, the video quality is poor. The trouble with most supposedly wireless network cameras (such as the D-Link Wireless N Home Camera DCS-930L or Philips In.Sight) is that while they may connect wirelessly for data, they still need one wire: power. This means that you're limited in where you can place the cameras, because they still need to be connected to the mains. This is the problem Netgear has set out to solve with its new VueZone system. Here, the cameras are battery powered and can be positioned wherever you like, thanks to some simple but clever hemispherical mounts. These can be either stuck or screwed to the wall. You might think 'battery powered' is a daft idea – who wants to be charging a camera every few days? Fortunately, Netgear has made a clever trade-off. These cameras aren't designed to be on, recording or monitoring, all the time. Instead, they're only on when you view one via the web or the accompanying iOS or Android app, or when the motion sensors trigger to take snapshots or chunks of video. As such, Netgear claims you can expect six months' battery life from the set of two CR123 batteries each camera takes, albeit based on 5 minutes' use per day. As should be obvious, then, VueZone isn't a system designed for always-on surveillance systems, the sort you'd find in shops, for example. Rather it's a way for normal folks to check in on pets and kids, to get alerts if someone breaks into your house, or to see if a package you've been expecting has arrived. The potential uses are pretty wide ranging. We tested VZSX2800, a pack that gives you two cameras – one able to view in the dark, when paired with the accompanying infra-red light – plus the base station and four mounts. Four mounts for two cameras? It makes sense when you remember that these are go-anywhere devices that attach to the mounts magnetically. You could position the four mounts throughout your house and move the two cameras around depending on what you wanted to keep an eye on. The base station has to connect via Ethernet to your router, and unsurprisingly it too requires power. Range is claimed at 300 feet (with a clear line of sight) which should be easily adequate for many homes. If not, you can add up to two more base stations, although that would require signing up to the top service tier, of which more shortly. The cameras themselves are about the size of a hen egg. They're light too, even with the batteries inserted. But with a maximum resolution of 640x480 pixels capturing at best three frames per second, the sensors inside them are lacklustre. The frame-rate doubles if you drop the resolution to 320x240 pixels, but that's very small and nowhere near full-motion video. We don't know what the equivalent ISO rating is for their light sensitivity, but it's got to be a low figure. It's a fixed focus lens from two feet, which is fine, and it's reasonably wide-angle. There's no optical zoom obviously, and no physical pan or tilt such as you'd find on the Aztech WIPC402. There's no microphone either, so you won't be able to hear what's happening in the remote location, nor use audio prompts such as a baby crying to trigger alerts. Let's start with the good stuff. Setup is easy. Having said that, it is a tiny bit fiddly, and we can imagine some less tech-savvy folks having to concentrate and work methodically through the steps. But compared to some network products that have you typing IP addresses into browsers and worse, Netgear has clearly worked hard here to make it as friendly as possible, and it has broadly succeeded. It should take you no more than a quarter of an hour to get the system set up and running – and that's including time looking thoughtfully at corners of rooms to work out where best to position your cameras, not to mention framing them up once everything's linked. Both the http://my.vuezone.com site and the smartphone apps are easy to use to view your cameras (you don't have to muck about with port forwarding for viewing remotely – it's all handled by your login). Some might say the latter are a little too basic, but others will appreciate the simplicity involved in viewing your cameras and recorded clips, arming/disarming the motion sensors and tweaking a few trigger, record and alert settings. While you can't name your cameras or base station through the app, you can however on my.vuezone.com. It's a neat example of thoughtful compromise on Netgear's part – keeping the app clutter-free rather than rammed with options you rarely use. Sadly, while there's a lot to like about the wirelessness and overall ease of use, the quality of the video just isn't very good. Not only is it low resolution, the images are also noisy and smeary in anything but blazing sunshine. It's not just visual quality that's poor either. The motion sensor often triggers quite late, which can leave you struggling to identify people in snapshots or videos. That might not seem a big deal if you just want to make sure the cat hasn't pulled down the curtains while you're at work. But if two-hundred-odd pounds' worth of kit can't help you identify thieves in the event of a break-in then you'll be left counting the cost in more ways than one. At present, the only kind of alerts the system can send are emails identifiable by a custom subject-line. We'd rather see support for push notifications via the smartphone apps, an idea that Netgear at least seemed open to implementing when we asked them. There's plenty more that could have been done with the smartphone apps, especially in terms of location awareness. We would have liked a geofencing feature enabling you to arm the motion sensors when you left home (with your smartphone in your pocket) and disarm them when you arrived back again. There are security implications to this, but they're not insurmountable. Frustratingly, you can't view your cameras on your smartphone if you're on the Basic (free) tier of the VueZone service plan. On Basic, you can have up to two cameras and view them via a desktop web browser, but that's it. In the interests of getting this review to you in a timely fashion, we haven't been able to test Netgear's six-month battery life claim, but we did ask the company why it used disposable Lithium batteries rather than rechargeable ones. "Cost and liability" came the reply, citing the comparative risk of rechargeables – which strikes us as a little disingenuous. Still, you can at least buy rechargeable CR123 batteries separately if you don't like the idea of feeding disposable batteries to your cameras. We wanted to like this so much. It's a novel approach, a nicely flexible system, and the setup is pleasantly simple. 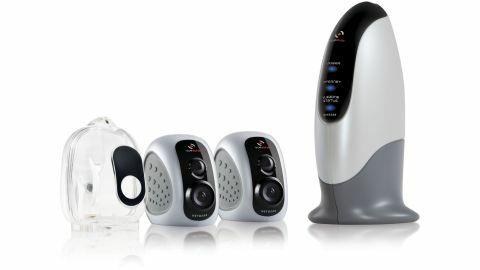 Basically, we were all set up to laud Netgear for having produced a wireless camera system that was fresh, innovative and welcome. Sadly however, ultimately it left us unsatisfied. There's definitely something liberating about being able to position a camera wherever you like and reposition it just as easily. We also have to commend the simplicity of the system, since it's so easy for complication to creep into network devices just because networking is complicated. Not only is it easy to set up, but it's also easy to connect to and expand with additional devices. It's another of VueZone's advantages – with a range of different cameras, mounts and tiers, you can expand your network of cameras organically into different parts of the house. And while it's hardly cheap, neither is it breathtakingly expensive. There are a few things we dislike, but most dislikeable is undoubtedly the quality of the video. In 2014, we shouldn't have to suffer low-res, noisy stills and low-framerate video. Okay, the video isn't atrocious, and it might be enough for you depending on your needs. But it is poor. We were also annoyed that you have to pay a subscription in order to be able to view your cameras on a smartphone, and that the smartphone apps have so much untapped potential – no push notifications and no location-aware smarts. There's a lot of promise here, and some folks at Netgear have obviously cared about this product. Some of our concerns are fixable, either with software updates or by tweaking the business plan. If you really can't use mains-powered network cameras, at least not without a lot of hassle or expense, and you don't primarily want the system for traditional anti-burglary needs, then you should consider VueZone. But the ropey quality of the video should give everyone else pause.